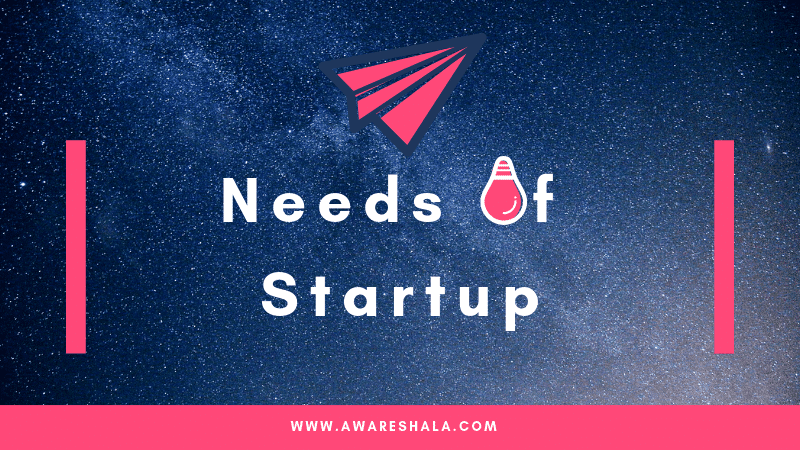 What are the things every startup needs? This is the first question strick in our mind when we think about startup and entrepreneurship. But Entrepreneurship is not everyone’s cup of tea. It requires courage, many sleepless nights and have to deal with unhappy consumers, angry investors, and many more to succeed in it. First of all, let’s define what a startup is? A startup is a youth company that is simply in the developing phase. Startups are generally small and at first, financed and worked by a bunch of originators or one person. These companies offer an item or administration that isn’t as of now being offered somewhere else in the market, or better say which is something new for consumers. 1. Indian government started the scheme of Startup India to create a job opportunity among the youth. After seeing the successful entrepreneurs like Ritesh Aggarwal (Oyo rooms founder), Vijay Shekhar Sharma (Paytm founder), Bansal Brother’s (Flipkart founder) etc everyone wants to be an entrepreneur. 2. Almost 12 lakhs Engineering students graduate every year. And job opportunities for newcomers is pathetic. So they have only one option left with them to create a job for themselves by owning a startup. 3. Also, entry to startup become quite inexpensive, especially in IT firms. You just need to spend some bucks and you are in network marketing. 4. Motivational speeches, TED Talks actually inspires the college’s students to think about startup and all. 5. This is what I mostly found in students as they think it’s all about fun and games. And started living an unrealistic life and consider themselves as next Bill Gates And Mark Zuckerberg. And they started talking in the air which is nothing but false craze going to destroy after some time. 6. Many of us don’t want to go through 9 to 5 job along with his/her Boss problem at the organization. So nowadays everyone wants to be a Self Made Boss. “Be The Boss” I like this concept. First of all, we have to identify the customers or the need that the market is not addressing. Someone will be going to pay us happily for what we provide to them. Targeting customers are basically identifying our own requirement and capabilities to do something. The products we’re delivering needs to specifically answer the neglected needs and wants of our customers. Customers are eagerly waiting for those type of products which are not in the market. You just have to identify what products are missing in your local life and surrounding. We must be able to sacrifice precious time of ours in reading, thinking for how business works? It will not only be a job, but it will also be the thing we’ll think about every waking hour. It is more important for us to land up with a good idea after sacrificing lots of time in it. And now we have to think about the implementation of this. Getting a great idea is not a necessary thing, other parameters also work togetherly. We can’t get success right away; we’ll need to be patient to boost the business. It might take anywhere from a year or more, depending on the type, segment, execution plan, resources etc. Depending upon what type of startup we want to, not everyone wants to “build the next Microsoft” but still, if we have the ambitions in place, and we are good at communicating that to others, we’ll go a long way. We’ll need to love what we want to do; otherwise, we won’t have the perseverance to stick to executing the idea in the bad phases. Along with passion push is needed every time i,e motivation. So for that, we have to read inspirational stories, watch the motivational video. Assuming that we have limited resources, we should opt out of any battles we are not confident that we can win, and preserve the resources for later opportunities. Statistically speaking, we’ll have a much better chance of succeeding if we can gather like-minded people to help us follow our vision. Every business requires money to get started, but the Idea should be more effective and great to made investors interested in our startup to fund. For this, we have to active in participating the startup events and summit. So finally we have our own startup in the market and this one is doing very well and our revenue is awesome but wait, where are you going see in front of you we have the Competitors welcoming you with big smiles. Watch this video for more details explanation. Aafan is a blogger who loves to share everything about entrepreneur and new web startup initiatives and has a quantum experience to share. You write such a good article and I like it too much. Keep up the good work. Hello Aafan. I am Shehbab Ali and I again visit on your blog and Here I find my comment. You are a good Blogger. Thanks, man for your valuable comments.